Do Real Estate Cycles Tell Us When To Sell A Home? A lot of the questions that I am getting these days refer to seasonality in real estate and specifically when to sell a home. While there are plenty of people who won't even think about the consequences of waiting until after the holidays, I am finding a growing trend of awareness among homeowners who understand they need to do diligent study before they sell their home. Gone are the days where you simply hire your tennis buddy to throw a sign in the yard, today's difficult housing market mixed with the complex science of internet marketing in real estate makes it a whole new day for choosing both the right real estate company to sell your home, as well as the best time of year to put it on the market. Can Real Estate Seasonality Tell Us When To Sell A Home? 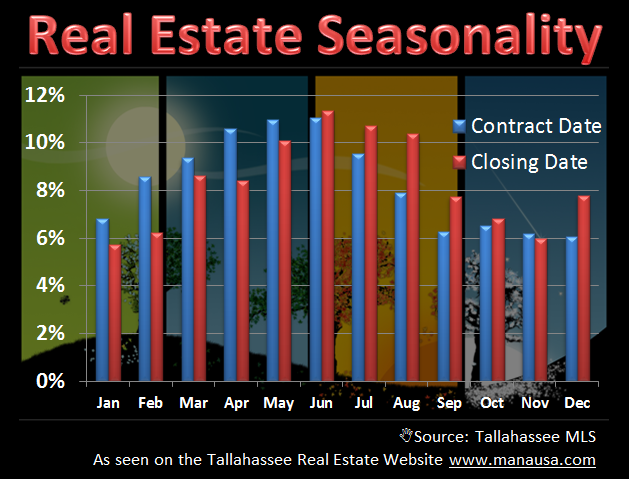 In order to determine the impact of real estate cycles on the success of selling a home, I went to the Tallahassee MLS and reviewed home sales going back to 2002. Using ten years of home sales in Tallahassee (2002 through 2011), I was able to construct the following real estate graph. It shows the percentage of new contracts as well as new closings for each month of the year. As you can tell from the results above, the months of April through June create the most contracts, while June, July and August record the most home sales. But does this mean that these are the months that you should market your home for sale? In order to discover the best answer on when to sell a home, I figured I had to also consider success rates too. Just because "the most" sold in a particular month wouldn't necessarily mean you had the best chance of selling, right? The next graph looks at real estate cycles, both the recorded sales like above, but additionally looking at the current inventory of homes for sale each month. By comparing the two, we develop a success analysis, or specifically the percent of inventory sold each month. Surprise, surprise. 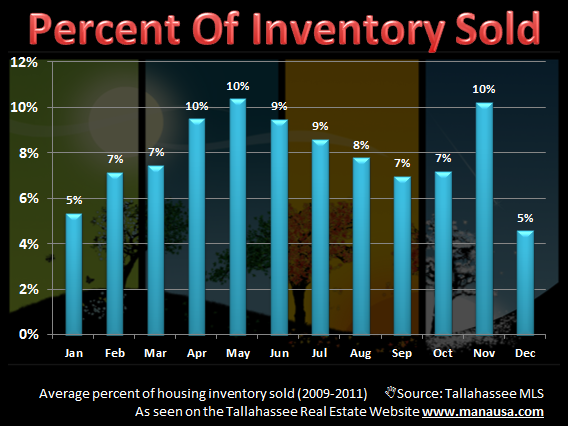 The second best month of the year to sell a home appears to be in November! More than 10% of the inventory of homes for sale will likely sell next month, based upon the pattern we have seen over the past three years. But did we miss something? Is this the proof that says November is the optimal time in the real estate cycle to sell a home, or is there another factor to consider? All of our recent market reports show that home values are still declining, so doesn't that mean the sooner you sell a home, the more money you will receive at closing? The two graphs above show likelihoods and odds, but the decision on when to sell a home could also be based upon trying to get the most money from the sale. If that is the prime concern (versus convenience of move), then the answer is not difficult to ascertain. Home values are falling, and that means "today" is the answer to "when to sell a home." If you are considering a move, just drop me a note and we can schedule a time to help you determine when to sell a home for the reasons best suited for you and your family.